Like the idea of a dumbbell only workout routine but need it to be a 3 day routine? Check out this 3 day powerlifting dumbbell routine. If you haven’t been following me, I started an eCommerce store called Strength Junkies and I sell home and commercial gym equipment. I am an authorized dealer for Troy Barbell and BodyCraft and adding more manufacturers soon. Below I will suggest a couple of different dumbbell sets you could buy that would work well with this routine. There are a lot of adjustable dumbbell sets out there that I’ve used and I would like to showcase a couple of products that would work extremely well for this routine. Adjustable dumbbells make training easy at home because you don’t need to have a wall full of dumbbells to train anything you need. There are a few sets and options I offer and I’ll go over their benefits and downsides below. 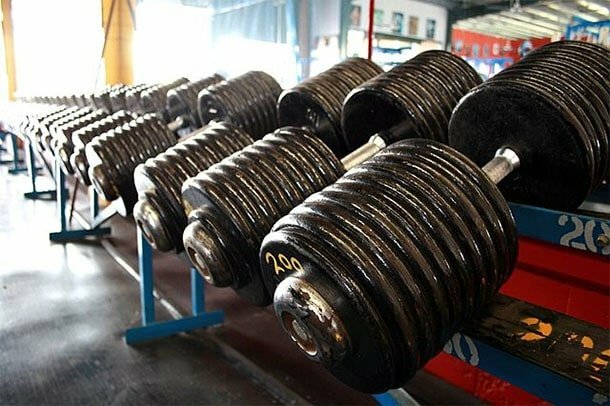 Before we get into the different sets, here are the threaded and regular handled dumbbell explanations. Pros: Holds strong for exercises like goblet squats and overhead tricep extensions. Cons: It sometimes comes a little loose when training and when changing weights it can be a pain. Pros: Easy to slide weights on (it’s just like the regular Olympic size). Cons: Weights can slide and the collars could come loose after a while. This set comes with 2 dumbbell handles, collars, and weights. You have the option to buy regular handles or threaded handles and it comes with everything you need to get started. This set will probably be the cheapest out of the bunch. Check out the next package before you make a decision. This set is probably the best value because you get an additional 50lbs of weight for only $30 more. Again, you have the option for regular handles or threaded and it comes with everything you need to get started. If you’re more interested in building a set or buying just the handles, I’ve got those as well. 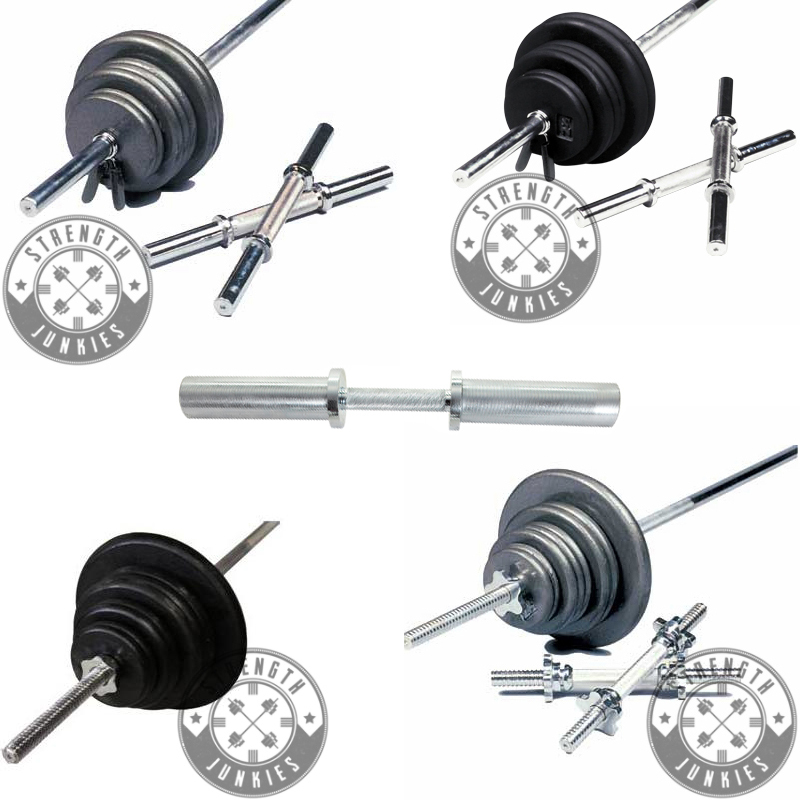 Troy Barbell Regular 1″ Handle Set – $49.99 a pair shipped. Uses spring lock collars and 1″ plates. The same handles that are in the sets above. I will throw in a set of spring lock collars if you buy these dumbbell handles. Troy Barbell Regular 1″ Threaded Handle Set – $49.99 a pair shipped. Uses spin lock collars and 1″ plates. This is also the same handles in the above sets. Spin lock collars come with these dumbbell handles. Troy Barbell Olympic Dumbbell Handle – $69.99 a piece shipped. These dumbbell handles are BEAST. These weigh 10 pounds without weights and they have a good medium knurling and it is a pretty good handle. Use whatever Olympic weights you have – 25s are about the biggest I would try to use just because of how big the plate is. Ideally have at least 1 day of rest in between your 4 days, I would highly recommend running the schedule like this. If you decide to do this routine, be sure to know your limits. Performing the exercise correctly at a lower weight will build more muscle and strength than it will trying to push as much weight as possible. When you concentrate on every rep of every set of every exercise, you are making a better mind and muscle connection. With this power you can grow your muscles and create the physique you’ve always wanted. Far too many people do not realize that you must add weight to each workout and progress so your body can adapt to the stress that is being put on it so always strive to add weight. As always, be sure to comment or ask any questions below, I would be happy to answer them. Be sure to follow us on Facebook and sign up for updates! I’ve actually never done preacher curls, but love the feeling of the concentration curls. I actually do have a quick question though. My bench won’t work for the Decline Sit-ups on day four. Any recommendations on a replacer excercise? If situps are kind of easy to you, grab some weight and just do weighted situps instead. You could probably get away with like sitting on the couch backwards and shoving your feet into the back cushion and then go all the way to the floor and up. Or you could hook your feet on something and turn your bench so you’re sitting perpendicular on it and just do full range situps like that. It’s sketchy but it works. Sweet thanks for the ideas! I’ll definitely mess around and figure something out. Work on progression and stay consistent. Everything else comes with time man. Is it okay to add kettlebell swings in the routine, or would be counter productive? Of course, those are a great functional movement and it’s great on your core. Enjoy them. I need to pick me up a set of kettlebells.